Longtime pharmacy partner of DSM, Health Care Systems of Montgomery Alabama has achieved COMPLETE certification on their EMR product. Many of you have the HCS pharmacy already, thought you might be interested. HCS has a unique approach to implementation as well, utilizing their Medication Reconciliation product to facilitate the CPOE. Anyway, the cert is new and still shows as “modular” on the ONC website, it will be updated in a few days on the ONC site, but until then, HCS has provided the ONC cert number which is CC-1112-107740-2. ONC-ATCB 2011/2012. Encrypted disk – The Hitech act imposes onerous reporting and notification responsibilities on any security breach when the disk is not encrypted. We have installed encrypted disk for our customers, and basically you cannot tell the difference in operation, there is no noticeable difference, it just means that if someone stole any data and tried to put it on another server, they would not be able to read it. Encrypted tape – Do you mail a tape for off-site backup? Do you take a tape home or offsite. These are all security risks. The new systems can provide encrypted tape backup which will allow these scenarios without a potential security breach. Elimination of interactive “governor” – “in Birmingham they love the guv’na”(Lynyrd Skynyrd), but nobody with an IBM i-series ever loved the interactive job governor. The governor is gone in the new Power I machines, and good riddance because you can tell it. Not only does the new Power I have an enormous amount of power over the old servers, it doesn’t have the “guv’na”. Big tape – in Seinfeld you had the “Big salad” episode, on the new Power I you can get the “big tape”. The LTO is a terrific tape drive capable of 800Gb of backup per tape, making it possible to do an ENTIRE system save in under 30 minutes. That has been our experience on our most recent installs. New and improved RAID – “RAID!” Remember the commercials with insects scrambling for cover, well it’s not that kind of RAID and you already have it on your server. RAID-5 protects the system in the event of a disk failure, keyword “a” disk failure. If two drives fail it means reloading the system, big trouble. With the new Power I, you have the option for RAID-6 which protects your system for up to two disk failures at one time. Sleep good at night, don’t let the bedbugs bite. V6 Release upgrade – in 7x24x365 operations our customer hospitals normally cannot spare the time for a full system upgrade, but many customers are running on older IBM operating system releases which are no longer supported. If IBM software maint has expired and you have not renewed, which many of our customers have chosen to not renew, the software maint and penalty is expensive. A new system will come pre-configured with the latest operating system upgrade, saving a huge headache of having to upgrade in place and the money for that software maint mentioned previously can be saved. Large disk capacity – Remember the recent DSH audits for years past? With the big disks you can take the past WITH you. In college we used to talk about “some day computers will have a terabyte of disk”, well that day is here. How many do you want? We wouldn’t sell it without at least one! Gigabit Ethernet – what kind of bandwidth do you have now? And after EMR implementation? Say goodbye to the 100MB adapter, Power I is Gigabit, with several ports for redundancy. POWER 7 and Release 7: The incredible new Power7 processors are out along with Release 7 of the operating system. More information will be coming on these announcements. Like there’s not enough out there to worry about…..
There’s a type of spyware that’s been going around for a few years known as “rogue spyware”. Basically they look legitimate with their Windows-style popups warning you of some impending doom if you don’t immediately scan your computer. If you choose to scan, then the spyware takes over your system, finds some bogus infections, and offers to fix the problem (for a fee, of course). To the untrained eye, trying to discern whether the infection warning is real or fake is like trying to find the difference between whether it’s live or Memorex! If you get an infection warning on your PC, and the hairs on your neck stand up, and you get that sinking feeling in the pit of your stomach, and an unexplainable anxiety washes over you, and you’re not in a campy horror movie, then call me. I’ll take a quick look at the message and find out if it’s legitimate or bogus. 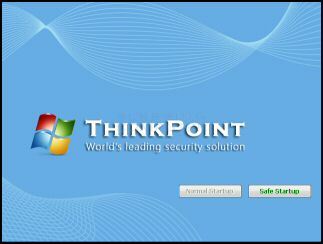 The latest rogue spyware I’ve encountered is Thinkpoint. Normally, this type of spyware feeds you a steady diet of annoying popups, but doesn’t actually stop you from using your computer. Not Thinkpoint. Oh no! Thinkpoint starts up when Windows boots, hijacks your computer, and keeps you from getting to your desktop. If you see this screen when you turn your computer on, then it's time to whip out the Lorazepam. If you see this screen then, sadly, it’s too late. The fix is pretty simple, but it involves deleting and changing some critical registry entries that, if done incorrectly, could turn your PC into an attractive and rather ineffective paperweight. Thinkpoint is an extreme case, but that’s not to say that you can’t catch some other malware infection. There are several common sense things you can do to minimize your chances of getting infected. 1. Don’t install unauthorized software on your PC. I know that new Fabio screen saver is irresistible, but do you really know where it’s coming from? Think about it…if a stranger stopped you on the street and offered you a brownie, would you eat it? Same principle! 2. If you do get infected, don’t ignore it. Like running from the cops, it will usually turn out badly. Talk to your IT people or call me if your PC gets infected. 3. Keep your anti-virus running and updated. This one’s pretty straight-forward, so there’s nothing cute to say about it, but if I think of something later I’ll silently pretend you thought it was funny. 4. Keep Windows updated. This one’s pretty straight-forward, too. so…there’s nothing cute yada yada yada…..
Catching some sort of funky malware is a part of using Windows, it seems. So if you find yourself in this position, give me a call at 601-925-6279 and I’ll solve the problem.